Wisdom of Life. : Chunk the rubbish and keep the apples. An intelligent and beautiful agent asked this question. I had a female prospect, 51 years old and still remain single. She is over-weight at 100 kgs with height at 5 feet. Currently on medication for high blood and diabetes. How can i get the company to insure her? Shall i reveal all her medical history to our underwriter? Another soft spoken lady agent asked. When i meet prospects who don't respect me and take me for granted, what are the best ways to overcome this situation? Most frequent question asked by the male agents... my clients are irresponsible. They always miss paying their premium, ending with high lapses over my sales. Though appointments were fixed, they aren't punctual or sometimes they failed to remain in their office to meet us. To answer all the above questions, firstly i have to remind all my fellow colleagues. Being intelligent alone isn't enough in our work, we have to be smart to overcome all the uncertainties. Intelligence to learn the trade and smartness keeps us longer in this challenging business. A friendly advice to that intelligent lady agent who had a case in hand. The fat female prospect could be your friend but she should not be your client. As an agent, you have to protect our principle company first and second to take care the interest for all your clients. As this prospect has very high risk with her health, the chances for her to be insured with a favourable cover is tough. You have to disclose all medical information to be fair to both parties concern. If i were you, i won't be wasting too much hope and effort on cases which i consider bad and risky. My principle in selling, "Buy insurance when you need it, coz when you need it, you can't buy." In order to sell effectively and successfully, and to be able to remain permanently in our career, the first important golden rule is to screen, select and qualify all our prospects before making them our clients for the future. I have to be comfortable with my prospects first before i allow them to be my clients. Meaning.. prospects have to respect who i am and also i could feel they are equally comfortable with me. As long as they respect me, i believe with my skill and knowledge, i could change their attitude of mind from bad to good, or negative to positive or even irresponsible to be more responsible in person. Without the respect, i don't think trust and value could be developed within the both clients and agent relationship. Next, do you have this special skill to feel with their presence whether the prospects have the potential to grow? The face could reveal much about a person value. The eyes tell all about his heart and mind. His words and thinking reflect his dreams and desire to live. I prefer to deal with clients who could grow and be successful in the long run. Their success helps me to grow stronger as well. Our country has 27 million population and within our city, Kuala Lumpur we have 3 million people. I know very well, i cannot be serving all 27 or 3 million people but i am sure i could do a good job by serving only 1000 clients. However i make certain these 1000 customers are the best who like and love me a lot. Today each year on average 100 of them make me happy by taking new policies with me. You think i am lucky! Yes! Because i selected the ideal clients many years ago. I chunk the rubbish and keep the apples. To that intelligent and beautiful agent i say...yes you are intelligent but you are not smart. You are too hunger for sale when you have forgotten there are still many apples for you to pick. If you continue to add more rubbish into your sales, in no time stress and pressure would overule you with problems. 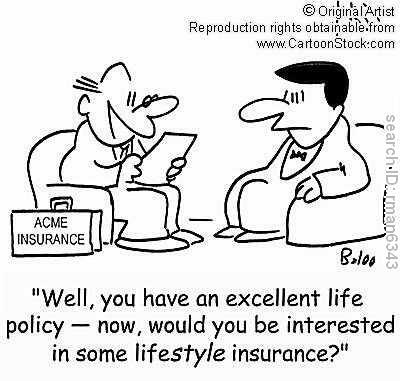 Selling life insurance is a long term career which requires fun and pleasure. Unless you take my advice as to follow the golden rule, selling would be tougher and more diffcult soon. I wish you best of luck. Insurance covered everything except what happened.... Someone told me like that, what does it mean? Insurance covers everything is true, you name it and we could do it. Except we could not cover what had happened or we could not cover the past. We cannot cover a person who is critically sick. We cannot cover a car which is already stolen. Buy insurance when you don't it. Because when you need it, you can't buy. I hope my reasoning is what you wanted.